AICA-Ribonucleotide (AICAR) AICAR (5-amino-1-β-D-ribofuranosyl-imidazole-4-carboxamide), also known as ZMP, is an analog of AMP that is capable of stimulating AMP-dependent protein kinase activity (AMPK). AICAR is being researched to treat and protect against cardiac ischemic injury. If left untreated, it may lead to a myocardial infarct. Cardiac Ischemia is caused by insufficient blood flow and oxygen to the myocardium. AICAR was first used in the 1980s as a method to preserve blood flow to the heart during surgery. Currently, AICAR has also been shown as a potential treatment for diabetes by increasing the metabolic activity of tissues by changing the physical composition of muscle. AICAR (commonly under the name Acadesine) is an analog of adenosine that enters cardiac cells to inhibit adenosine kinase and adenosine deaminase. It enhances the rate of nucleotide re-synthesis increasing adenosine generation from adenosine monophosphate only during conditions of myocardial ischemia. In cardiac myocytes, AICA-riboside is phosphorylated to AICA-ribotide (ZMP) to activate AMPK without changing the levels of the nucleotides. ZMP is able to enter the de novo synthesis pathway for adenosine synthesis to inhibit adenosine deaminase causing an increase in ATP levels and adenosine levels. It has been shown that a brief period of coronary arterial occlusion followed by reperfusion prior to prolonged ischemia is known as preconditioning. It has been shown that this is protective. Preconditioning preceded myocardial infarction, may delay cell death and allow for greater salvage of myocardium through reperfusion therapy. AICAR has been shown to precondition the heart shortly before or during ischemia. AICAR triggers a preconditioned anti-inflammatory state by increasing NO production from endothelial nitric oxide synthase. When AICAR is given 24 hours prior to reperfusion, it prevents post ischemic leukocyte-endothelial cell adhesive interactions with increased NO production. AICAR-dependent preconditioning is also mediated by an ATP-sensitive potassium channel and hemeoxygenase-dependent mechanism. It increases AMPK-dependent recruitment of ATP-sensitive K channels to the sarcolemma causing the action potential duration to shorten, and preventing calcium overload during reperfusion. The decrease in calcium overload prevents inflammation activation by ROS. AICAR also increases AMPK-dependent glucose uptake through translocation of GLUT-4 which is beneficial for the heart during post-ischemic reperfusion. The increase in glucose during AICAR preconditioning lengthens the period for preconditioning up to 2 hours in rabbits and 40 minutes in humans undergoing coronary ligation. 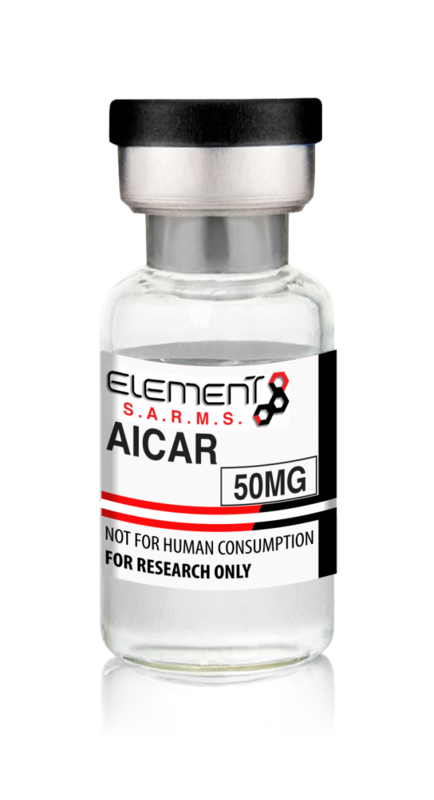 As a result, AICAR reduces the frequency and size of myocardial infarcts up to 25% in humans allowing improved blood flow to the heart. As well, the treatment has been shown to decrease the risk of an early death and improve recovery after surgery from an ischemic injury. Fast shipping, trusted vendor. Bought this for research purposes. I am amazed by the quality of GW . All I do is talk about it. Customer service is great. Very fast and prompt response and fast shipping!